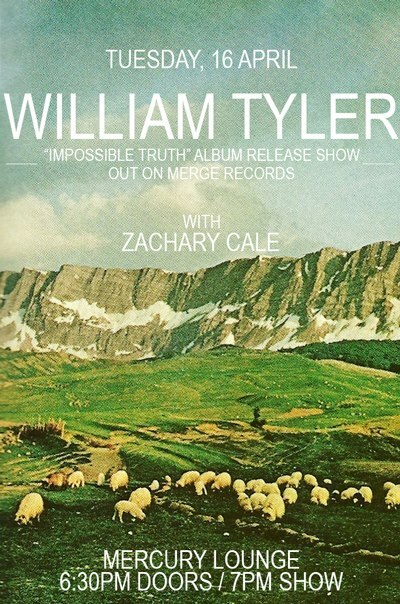 Mercury Lounge show supporting William Tyler! Pleased to announce I’ll be supporting the amazing William Tyler for his record release show at The Mercury Lounge this Tuesday night, April 16th. His new record Impossible Truth is epic! If you like the sound of 6 strings then do yourself a favor and pick this one up. This is the early show! Doors are at 6:30. I’ll be going on at 7 sharp, so come out early if you can! In other news, the new record is being mastered this week! It’s called Blue Rider. Can’t disclose many details about it yet but I’ll definitely be playing a bunch of the tunes at the show on Tuesday. Here’s a live video of one of the songs that my friend Ryan shot with his fish-eye camera.